There are only four survivors. Three are children, who emerge from the wreckage seemingly unhurt. But they are not unchanged. And the fourth is Pamela May Donald, who lives just long enough to record a voice message on her phone. A message that will change the world. Pamela May Donald is on her way to visit her daughter, who's teaching in Japan, when her commuter plane crashes into a forest. We're with her as the plane goes down. We're also with her she lies dying on the cold ground, terrified by what she's seeing, and as she records a voice message on her mobile phone. And then the perspective changes. It's months later, and we're reading a book published by an author who's been investigating the disturbing events sparked off by "Black Thursday". Because Pamela's plane wasn't the only one that went down that day. There were 4, each in a different continent. And in 3 of them, a single child survived. Through fragments of different materials (interviews, chat transcripts, reports), we find out more about what it was that happened after the crashes. At first we only know that it was something really disturbing and that all sorts of conspiracy theories have flourished, and Lotz only gradually gives us more details. The Three was terrifying. I read it compulsively, but I had to stop myself at least an hour before going to bed and read something fluffy and nice, otherwise I knew I'd have nightmares all night (that said, I did have a very strange dream the first night... David Cameron was reading me a socialist version of a Dr. Seuss book. Inexplicable). The events that are being described are creepy enough. The children survivors are clearly a bit 'off', but the ways in which this is the case are really well done. The little girl, especially. *shivers* And the structure really helped. Having the narrator/compiler have the benefit of hindsight worked to ratchet up the dread. Even the innocuous, straightforward sections at the beginning, before people are really aware that something's wrong, were given a whole new perspective by the little introductory paragraphs. For instance, before the first chat transcript between two Japanese teens, one of whom is the cousin of one of the crash survivors, we're told these were recovered from their computers. I shivered. These little hints didn't feel annoying or manipulative, as they were exactly what an author would write if she was certain her readers would know what had happened already. It really worked. I know some people have trouble with this sort of "found material" approach (the complaints I've seen centre around there not being a protagonist), but I love it. It almost always works for me, and it did so here. It wasn't perfect, mainly because if you have so many different voices they do have to sound different, and some of them didn't. The chatting Japanese teens, for instance, didn't ring 100% true and sounded a bit too similar to others. But on the whole, this was great. I loved having the different perspectives, and I loved that we had a sort of double layer of unreliable narrators. You don't know if the people telling their stories are being truthful or are lying (or even whether they're completely deluded and psychotic). You also don't know whether the author compiling the material, who ends up being a character in her own right, has an agenda, and is therefore manipulating what bits and pieces get included in the book. This structure worked beautifully with the subject matter. For all that I enjoyed the hell out of these books, I did have some niggles. Mostly it raced along, but there was a spell round the middle where it felt like the narrative was going round in circles. The forward momentum was resumed after a while, but those sections needed better editing. I was also a bit queasy about some of the US characters, mainly Pastor Len and the people who start following him and his end-of-times theories. These characters felt a little too cartoonish, too unsubtle. The big problem I had, though, was with the ending. No spoilers here, I'll be quite general. A lot of the enjoyment in this book was in the journey, the mysterious events and the wondering about just what on earth is going on, but you do need some sort of resolution. Lotz gives us one here, of a sort. It's not something definite, and the reader needs to decide what she thinks it means, but it's something. It felt unsatisfying, though. What I interpreted explained some things, but for a lot of them I still thought "But why would they...?". I'm not sure if the problem is in my interpretation or in us not being given enough to go on, but reading other reviews, it sounds like it might be the latter. Anyway, if any of you have read it, I'd love to discuss the ending, to see if you've reached the same conclusions I did. Even with a problematic ending, I still really liked this. 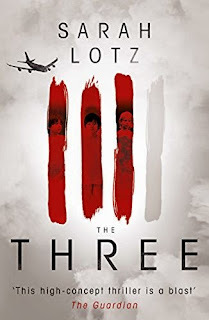 Lotz has another similar-sounding book coming out (not a sequel, but seemingly connected to this in some way), and I'll definitely be buying that. Terrifying because it was so believable or terrifying in THE BAD SEED (the movie) way? I can handle the first--what's scarier than reality, after all--but the second, I just can't do. Either way, it sounds interesting. Oh, I would say the former. It's not about the kids being evil, but about the media circus and crazy conspiracy theories that develop around them. With the complication, of course, that you don't know if those nutters might not actually be right, because the kids are definitely a bit off. I was both satisfied by the ending and not. I'd read some of the reviews which stated that it ended abruptly and ambiguously, so I was assuming that we'd never really know whether the kids were really "off" or if it was just the unreliability of the narrators that made them seem so strange. So I was pleasantly surprised that was actually resolved. I also agree about how terrifying the events surrounding it became. The kids could be creepy, but the changes around the world were all too believable. It seemed headed straight toward a world that was a cross between 1984 and The Handmaid's Tale, which are each frightening enough on their own. Meljean: Oh, yes, it's basically oral history as well, isn't it? I hadn't made the connection. On the ending, I wonder if it wouldn't have been better to not get that resolution at all. Either to leave it as a mystery or to get a proper conclusion that explains the weird stuff (that would have been ideal; I love that moment where you get a revelation and then you think back all through the book and go "oh, so that's why X, and that's why Y..."). Getting something in the middle just felt unsatisfying. I agree that the stuff that happened around them felt scarily believable. That new US president was truly terrifying!